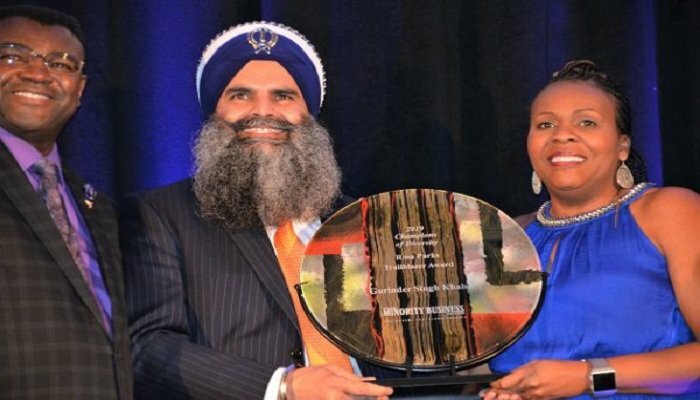 Indian-American philanthropist and entrepreneur, Gurinder Singh Khalsa, has been presented with the prestigious Rosa Parks Trailblazer award for his campaign that forced US authorities to change their policy towards turban (headgear of the Sikh community). Gurinder Singh Khalsa is an Indian-American entrepreneur, philanthropist and leader in the Sikh community in Indiana. Originally hailing from Ambala district in Haryana (north Indian state), Gurinder Singh, the founder and chairman of SikhsPAC and SikhsMEDIA was presented the Distinguished 2019 Champions of Diversity-Rosa Parks Trailblazer award by state representative of Indiana Robin Shackleford and Robert Shegog, vice president and chief operating officer at the Indianapolis Recorder Newspaper and Indiana Minority Business Magazine. In 2007, Gurinder Singh Khalsa was traveling from his home in Buffalo, New York, to Sacramento, California, to visit his ailing mother, but instead met with an unfortunate dilemma between his lifelong religious beliefs and his family as he was going through the Transportation and Security Administration’s (TSA) security screening. The agent had asked him to remove his turban, which according to the Sikh culture is an article of faith and cannot be removed in public. Following the incident, Khalsa mobilized more than 67,000 people nationwide for petitions and took the issue all the way to the US Congress, which forced TSA to change its headgear policy towards the Sikh community. Eventually the request by the agents, the choices he made and the resulting Congressional actions thereafter, inspired director Jenna Ruiz to make a short film on him. Through the film, she wants to educate people about the Sikh culture and wash away the stereotypes, along with negating the unnecessary fear that many people have regarding the turban and other articles of faith. Jose Lusende, vice president for Strategy and External Relation of Recorder Media Group, said during the event that the Rosa Parks Trailblazer Award is one of three special awards that the Indiana Minority Business Magazine offers. “Rosa Parks refused to stand up on the bus, changing the cause of actions that led to igniting the civil rights movement,” Lusende said. “Gurinder, he was going through security and they told him he needed to remove his turban and he refused to do that. It went all the way to the (US) Senate to order TSA to change the policy requiring people to remove their turbans. We thought that was very important, and that is why he is getting the award,” she added.